Sitting all day ... standing all day ... it's really the "all day" part that's the problem. 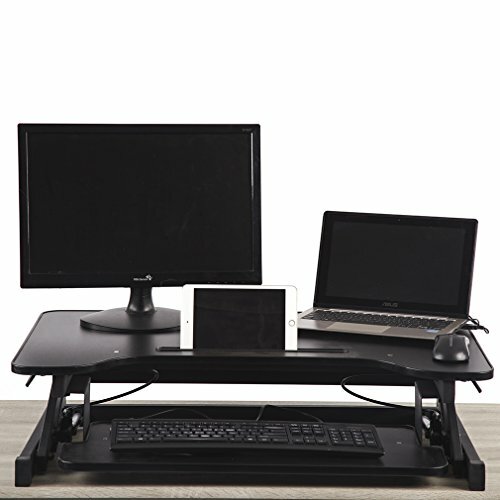 Our desktop workstation provides an easy way to transition between sitting and standing throughout the workday. It was designed to assist those who are challenged with back, neck, posture, and circulation problems. 1.Large Work Surface, Wide Keyboard Tray. 2.Adjust desk Riser to any heights to sit or stand as you work. 3.Front tray on top surface,provides extra space for cell phones, Ipad, pens, sticky notes, and more. 4.Dual Gas springs,make the surface lift more easily and smoothly. Height Adjustable Desk:This height adjustable standing desk converter transitions to the perfect height with minimal effort. When you are ready to stand, simply raise your entire workstation to your desired height. Large Surface Desk:The two-tier system keeps your keyboard and mouse on a separate 26"x11"surface at an ergonomic position for your wrists. The top 32"x 21"surface easily holds two side by side monitors along with decor, writing utensils, notebooks, mugs, and more. Desk with Tablet Holder:Keep your smartphone or other devices at an easy viewing angle and within arm's reach at all time. Ergonomic Standing Desk:Choose from 6-16.3 inches at any height as you transition between sitting and standing throughout the day. High Quality Table:Gives you peace of mind about our uncompromising commitment to provide an excellent product.